Whereas we recently wondered whether there was a "stealth rally" playing out on the NASDAQ, it is now clear that there wasn't. The chart below shows the situation. 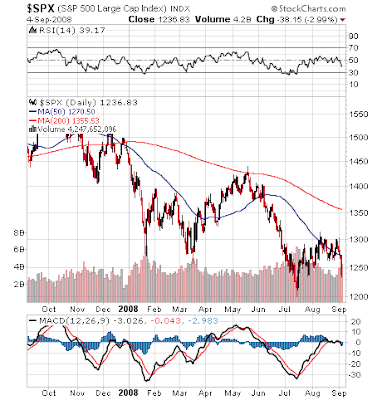 In the case of the NASDAQ, the index pushed above its 50-day moving average but essentially failed at the 200-day MA. 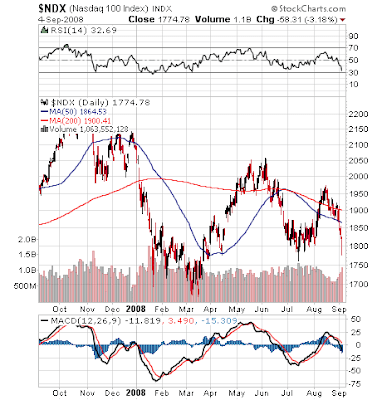 In concert with the other major averages, the NASDAQ has also plunged and is now in the vicinity of its July low. Are there any signs of life left in this market? 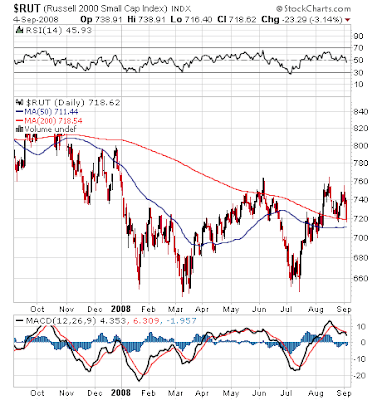 In the following chart, we can see that the Russell 2000 has also plunged but as of the close today it remains right at its 200-day moving average. After the last few days of bearishness, this chart is about as good as it gets. The charts are a picture of sudden and severe bearishness. All of the downward moves illustrated above took place on increasing volume. Whereas lack of volume was an issue in August, in September it seems to be indicating an increasing and pervasive pessimism on the part of investors. What's next? Friday's employment report will be watched closely. With the August results for non-farm payrolls included, the report could push the market further off the cliff if the numbers come in below what are already low expectations.